Auranofin drug molecule. Computer artwork showing the structure of a molecule of the drug auranofin. Auranofin, marketed under the name Ridaura, is a gold complex classified by the World Health Organization as an antirheumatic agent. It is used to treat rheumatoid arthritis but also has interesting antiparasitic and antiviral effects. 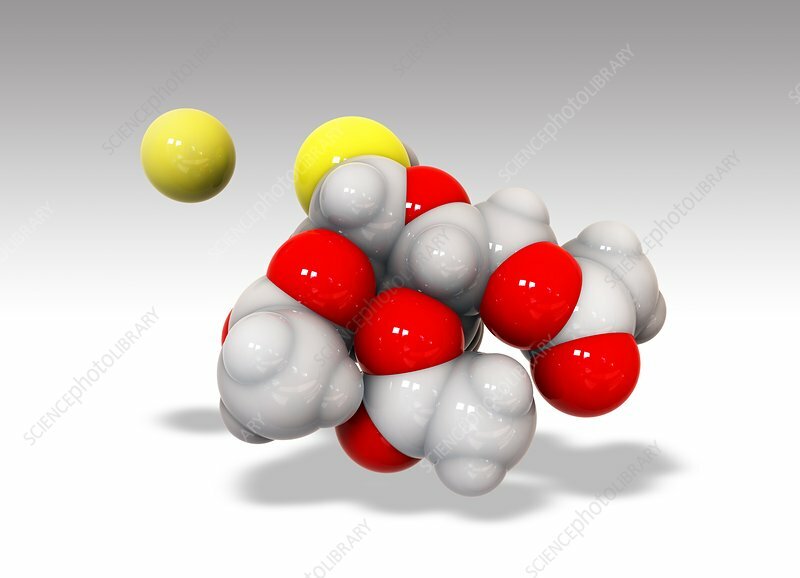 Atoms are represented as spheres and are colour-coded: carbon (large, grey), hydrogen (small, grey), sulphur (yellow), and oxygen (red) - the green sphere represents a phosphorus-gold group.